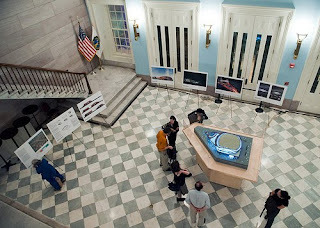 Well, the second community information session promised by the Empire State Development Corporation (ESDC) on Atlantic Yards, held last night at Brooklyn's Borough Hall, was much less eventful and enlightening than the first one held July 22, when representatives of the ESDC and developer Forest City Ratner faced, answered, and evaded a series of tough questions. There was some helpful data: arena construction should take 26 months (the goal apparently is All-Star Break 2012); the arena would be 137 feet tall at its peak; and the floor of the arena would be 25 feet below grade. 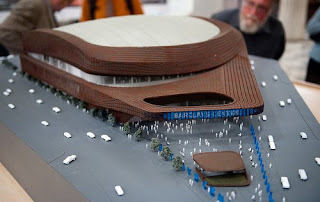 And they suggested that the arena must be able to serve as a standalone as well as a composition with the other towers initially designed to wrap them. When exactly those other buildings would be built was unclear, though the models leave spaces for them. Apparently there's no plan now to build foundations for them. Such bigger questions, including ones about professional ethics, were missing--and the architects didn't stick around to answer them, as Forest City Ratner spokesman Joe DePlasco quickly whisked them away from an impromptu press conference. Moreover, architect Bill Crockett, in praising the transportation access, neglected to mention interim surface parking and compared the arena to the Verizon Center in Washington, which lacks onsite parking but has 10,000 spaces within ten blocks. The Brooklyn Paper called it a "bombshell" that the freshly drafted design would be "radically altered" to accommodate other buildings. I'm not so sure; it's implied that there are spaces around the arena for towers 2-4, while alterations in the plaza and the brim-like oculus would be necessary if Building 1 were constructed. 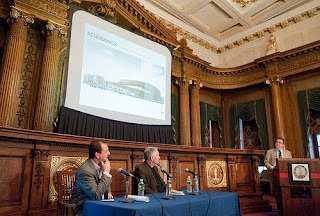 Maybe the problem was that the event last night at Borough Hall was an afterthought, awkwardly combined with a continuing education opportunity for architects, sponsored by the Center for Architecture, to learn from the principal designers of the Atlantic Yards arena. ESDC VP Darren Bloch (below right) noted that the first session focused on modifications to the General Project Plan and "this session we’d like to focus on elements of the new design." "I think this is primarily an audience of practitioners," declared Crockett, early in his presentation. About 120 people were in the audience; I'd estimate that several dozen people weren't practitioners. Crockett apparently didn't get the memo from ESDC. 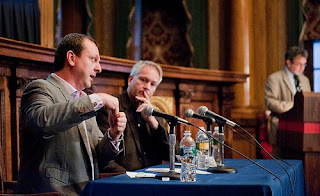 Then again, host Bell, AIA New York executive director, kept the discussion focused on narrow design issues, at several times quoting flowery poetry or basketball memoirs in an apparent effort to serve as a muse to the panelists. Questions were submitted in writing and vetted by Center staff. Bell, who said at the end that "I for one look forward to seeing it built and maybe attending my Nets first game," explained afterward that the event had been scheduled because of his connection with SHoP Architects, the new firm working on the arena, and his interest in having them share their thoughts with practitioners. How did that continuing education event morph into a session co-sponsored by the ESDC? Bell wasn't sure. Here's a guess. Once Bell arranged the event with SHoP, the architects mentioned it to their client, who, in conversation with the ESDC, found a way to comply with the letter if not the spirit of former CEO Marisa Lago's pledge to hold two information sessions. 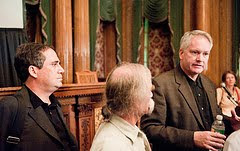 Thus arena expert Crockett and SHoP co-founder Pasquarelli were reasonably informative about design issues, but they were more closemouthed when faced with larger questions raised by the project. At one point Bell read two related questions. Isn't there an argument for keeping Fifth Avenue open until at least until the next building is built? (Actually, the question specifically cited Building 1, which would overlap Fifth Avenue.) Similarly, the Municipal Art Society has said that reorientation of the arena to a north-south axis could allow Fifth Avenue to stay open, albeit with one fewer tower. Did the architects consider that option? They looked puzzled, and shrugged. "I don’t think it fits," said Pasquarelli. It may not, given the seeming east-west axis--which allows space for towers--but there was no follow-up to point out that Building 1 is on indefinite hold. At the end of the meeting, Bell brushed off a question from architect and urban planner Ron Shiffman. "We are divorcing that," Bell said, reiterating that the issue of the night was design. "Design cannot be separated from the ethics," Shiffman responded. (Indeed, New York Magazine critic Justin Davidson agrees.) 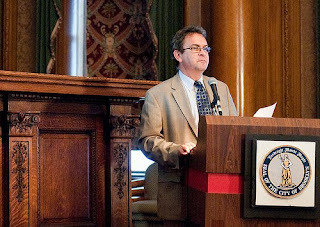 He later told the Brooklyn Paper that "architects had a responsibility to talk to opponents and understand the issues before putting out renderings that are now being used as a marketing scheme for the developer." Earlier in the day, the New York Observer published an interview with Pasquarelli in which he said "we gave serious consideration as to whether we wanted to do it. And I think the thing that convinced us was, after speaking with Bruce, we were convinced he really wanted to make a great building." How did Pasquarelli feel about designing a project that’s making a superblock out of a grid? "Over a site that has that much transportation infrastructure, I think it’s the only ethical, rational, sustainable thing to do to put density, and sometimes density requires some superblocks," he said, to which the response is: the requirement for a superblock in this case is an arena, not density. One marketing scheme that the architects did avoid was choosing a nickname for the building. Bell referenced a poll in Crain's in which participants suggested Birdsnest, Clamshell, Panini Maker, and Darth Arena. "Is there an identifying conceptual metaphor, as to how you see it?" Bell asked. Pasquarelli shrugged it off. "Metaphors are so like 1997," he said. Bell was undaunted, offering his own observation, suggesting that the texture and color of the building reminded him of a basketball that he keeps not fully inflated. After Bell's introduction, Crockett gave background on his firm, which has designed 18 NBA/NHL venues and was proud of doing so in urban contexts and of getting consistent kudos from fans in reader polls. "The building, I’m convinced can have a very positive impact on the urban redevelopment context,” he said, acknowledging, "This is probably not a project for the faint of heart." Then again, Ellerbe Becket has taken on some tough commissions, including the post-Katrina renewal of the Louisiana Superdome. Pasquarelli explained that SHoP originated as an acronym for three names and five partners--two husbands and wives, and the identical twin brother to one of the husbands. He made no reference to the apparent back story: after Frank Gehry was dropped from the project and renderings of the hangar-like Ellerbe Becket arena were released, Forest City Ratner in June went to a buzzy architect to add a new skin--though not a fundamental reorientation--to the arena. "It was an amazing opportunity for us to collaborate with Ellerbe Becket and try to make it as powerful a project as we could," he said. "One of the important things was looking at the Gehry master plan, which was something was still intact and will be used," he said. The arena is still in the same place, and, "one of the key elements is there’s still the room to put all the buildings around the arena." Crockett said that the Atlantic and Flatbush avenues frame the main entrance plaza, with very large opening or portal that allows access, and there are direct views into the arena from the plaza and from adjoining streets. Pasquarelli encouraged people to look at the model and see the views from the plaza. "We’re very excited about that direct participation," Crockett said. Crockett said the design has evolved to an almost octagonal shape, "more of a basketball geometry, more foreshortened," allowing seats to be closer to the action, as compared to hockey. It was the only indirect reference to the fact that the shrinking of the arena from 850,000 square feet to 675,000 square feet eliminates the option for hockey. The site plan shows retail in goldenrod, including a team store and a "soda shop," which is actually the Jones Soda Shoppe, the product of a sponsor. Later, Bell asked what percentage of the commercial space would be occupied by local vendors. "I heard the word 'soda shop' and had this vision of egg cream." "Certainly the building wants to have its own team store," Pasquarelli said, adding that "the scale of retail is all very small." The strategy to break down the mass of the building, said Pasquarelli, involves three horizontal bands. "So one band engages the street, the upper band engages the roof; the middle band--the glazing engages the second level, the promenade." "One of the other things we felt was really important was making a grand civic gesture onto the plaza, this sort of canopy. It has a large oculus in the middle so light can penetrate through. It's more than 30 feet in the air and it becomes this way of seeing the building as you approach it from the west. That was something we felt was extremely important to engage that public plaza." He said the practice court, sunk below street level, was seen by the client "as something that really engages the community." The upper band "really positions the building on the skyline." The street level provides more of a four- or five-story context. "Then you have tremendous amounts of transparency at the ground level, so there's a different kind of experience when you’re the pedestrian." Crockett said there's a blank façade where the future residential towers would be , so it allowed them to concentrate transparent elements at Flatbush and Atlantic. Speaking of materials, Pasquarelli said the weathered steel "weathers to a beautiful, sort of warm, brown, almost cordovan color… we wanted something that would patina and something that was warm, but also very urban." He gave an example of a similar material: the Ford Foundation building in Manhattan. While the Urban Room, yet unbuilt, was once supposed to have signage up to 150 feet, the arena would have less ambitious signage, with it embedded in the facade of the arena. "There will obviously be signage," Pasquarelli said. "The signage is developing. All the signage will follow the design guidelines…. There’s a very strong desire to integrate the signage with the architecture itself." The canopy = Urban Room? Crockett said that the canopy, the oculus, "that large gesture" occupies the space of "what will ultimately be the Urban Room." That statement didn't get a follow-up, but it was rather confusing. The Urban Room was supposed to serve as the western entrance to Building 1, as well as the arena. Bell read a question about the status of the security analysis. "Yes, we are working with NYPD," Crockett said briefly. "We’re working with them to comply with all the security requirements." 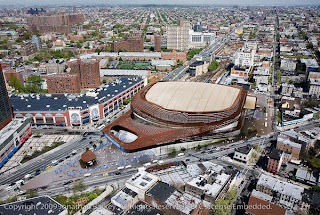 Later, the architects confirmed that the arena would be 20 feet from the street at Flatbush and Atlantic avenues--the same distance as in Newark, where streets have been closed. Crockett later said that he couldn't talk in detail about the glass, because of security issues. "The client has asked us to look at how the building will evolve when building 1 goes in," Pasquarelli said. "There are lots of different ideas about how the canopy could be extended to create the Urban Room, how it could be removed, how escalators or elevators could be extended to go through the oculus. There are lots of different ideas of how it could be integrated into a single whole. We’re really excited about the design challenge of how it would be done. There's nothing in the design that would preclude the building of Building 1. How will design incorporate yet unplanned buildings and open space? 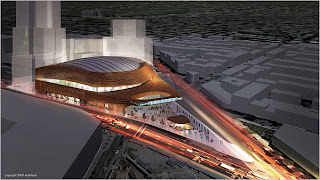 "The current plan by the client is to get Building 2 started six to nine months after the arena begins. We are not the architects of the other buildings, although we'd be certainly happy to do it," he said to chuckles. "There are lots of ideas on how that skin could be incorporated or contrasted…. We’ve looked at lots of different ideas and sketches about how the four buildings could work." The primary entrance to the arena is off the main plaza. There's another entrance planned for Dean Street at the south and another on Atlantic Avenue at the north. The VIP entrance is on the northwest side of the building. "They're sized for the current capacity of the building, to follow all codes and regulations," Pasquarelli said. How was the building downsized? The number of suites has been reduced from 130 to 100 and the mix has evolved, Crockett said, noting that many of the suites are smaller than originally planned, "given the realities of the market." Some of the changes represent a "different configuration, nipping and tucking and being more efficient... and scaling back elements of the program not critical to the daily function of the arena. Some of the office and other support functions for the arena can now be housed offsite." He didn't mention the elimination of hockey. Bell read a question that he prefaced as a hostile one: What specific steps have the arena architects taken to site arena inside a residential neighborhood? "I tried to hit a few highlights, having been a part of development of a number of arena, most of them in urban contexts," Crockett said. "I think ultimately the presence of the arena will help define this district as one of the special features, special attributes of the district." He said that, given that the primary facades are retail, accessible 9 to 5, "I think that's a huge part of making the building part of the community, not a foreign object." (Actually, given that retail in New York typically lasts until the evening, the 9 to 5 schedule of buildings like the Atlantic Center Mall has been criticized. "This is such a different arena," he said, "compared to previous generations." Even Conseco Fieldhouse in Indianapolis does not meet grade with retail and transparency. "So I think all the gestures that have gone into the long-term planning for this facility really will make it a great arena in its context." "Further," he said, "I think you couldn’t ask for a better site in terms of the transit access and visibility for the building." "I’m actually pretty excited by the mitigation of the scale," Crockett said. "This is an arena. It's a relatively large building. It’s probably the only building of its type in its community. So I think it's OK and good for it to express itself as that type of building. 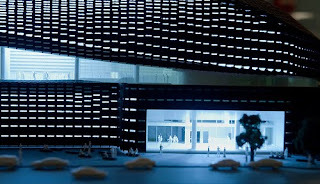 However, fundamental steps have been taken to mitigate the scale… by placing the event floor, the lower level of the building into the ground about 25 feet, that directly translates into lowering the highest point of the roof. Also, the arch form…. translates into reduced bulk and mass, the silhouette of the arena on the skyline. So, on the one hand, this is an iconic building… however, in terms of not making it any larger in terms of height or mass than it needs to be… working from the roughly 40-foot height datum line, which corresponds to the nominal height of the buildings in the neighborhood, it introduces horizontality." "I agree with everything Bill is saying," Pasquarelli followed up. 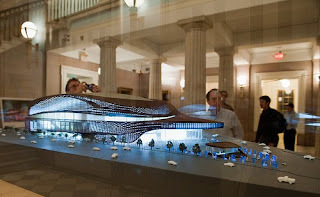 "The arena has to stand on its own on day one and stand on its own when it's a composition with the other buildings. We think that it can do that. And when the other buildings are in place, you'll have a very different kind of feel all the way around. The design guidelines require a tremendous amount of retail at the base of those buildings." What's the lifespan of the building? "Our goal is this will be a building that will endure and can be adapted and will last for many generations," said Crockett, suggesting an absolute minimum of 30 years. Pasquarelli said the material of the latticework often lasts 50 years or more. He said it was easy and cost-effective to maintain, "so we’re very hopeful of the longevity of the building." How does the design complement and relate to the best of the local architecture and landmarks nearby? 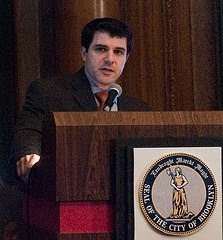 "The first thing that’s important is the connection to transit," Pasquarelli said. "You're either coming down Atlantic or coming down Flatbush. You'll have two places where you'll see it from the greatest distance. And having a kind of iconic structure that tries to blend horizontality versus the verticality, is the right way to go for the arena. The worst thing you could do is make neo-historicist copies of the beautiful historic buildings, in this context. We try not to do that. It’s clearly a building of its time.."
He said that the use of natural materials and various levels aimed to break down the scale of the arena. "It’s a large building," he said. "A lot of care needs to be taken in how it’s detailed.. and how it's read… on the skyline, in the neighborhood, and standing next to it." The top height of the building is 137 feet from the sidewalk, but only at the center. In several places, it would be closer to 100 feet. What types of changes do the architects anticipate following approval of the project? "Not changes but refinement," Crockett said. "We're continue to work on the patterning," Pasquarelli said. "We're refining some of the curvatures, to make it more beautiful." What's been learned from other arenas? "I think what we’ve learned is what gives me faith that this design direction is a very good one for the right level of activation and integration as to what's going on in the neighborhood," Crockett said. The arena in Washington, DC now known as the Verizon Center has been "virtually the cornerstone of redeveloping an area that was in some real trouble," he said, not making the contrast between that and the "great piece of real estate" noted by Forest City Enterprises CEO Chuck Ratner. The new arena has much more transparency, "and the building gains a lot , in terms of wayfinding and fan experience," he said. "It’s going to be very clear they can be nowhere but Brooklyn, NY." He again praised the transit access as "just an amazing asset for the facility" and pointed out that the arena in Washington does not have parking on-site. "You don’t need it, you don’t really want it in an urban setting, so it's really a benefit when we have that kind of site." Unmentioned: more than 1000 spaces of interim surface parking planned for the southeast block, 1129, and that the Verizon Center is near an area with many offices, and, according to the official site, there are approximately 10,000 parking spaces available in area parking lots and garages within 10 blocks." Atlantic Yards, when built out, is supposed to have 2570 underground spaces intended for the project's residential component and an additional 1100 underground spaces for the arena. When the event was over, several people stuck around to ask follow-up questions and to question the planning for and premise of the meeting itself. In photo at right, Dean Street resident Peter Krashes, whose home is across the street from the block destined for interim surface parking, criticizes the ESDC for short notice for the event--word emerged last Wednesday but it was not officially announced to architects until Thursday and to the public until Friday. In the center of the photo is the ESDC's Bloch. Bell is in the foreground at left. At left in the background is ESDC spokesman Warner Johnston.